I like to make big burgers, so mine are 1/3 lb (150 g) each. Prepare an outdoor grill to cook direct over medium-high heat. 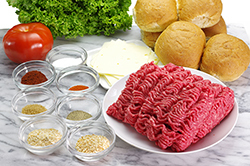 Form the beef into six equal-size balls, and then form each ball into a patty, trying not to pack the meat too firmly. As you finish the patty, push your fingers into the center so it’s a little thinner there. 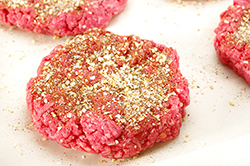 Season the burgers liberally with the rub. 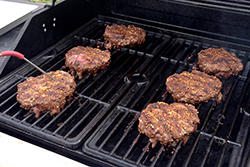 Place the burgers directly on the cooking grate and cook them for 3 to 4 minutes, until golden brown on the bottom. Flip and cook them for another 3 to 4 minutes, until golden brown on the second side. 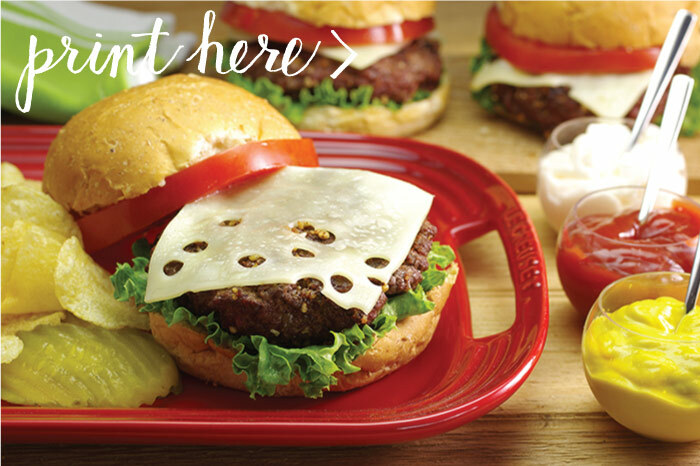 Flip the burgers over again and top with the cheese. Cook them for another 1 to 2 minutes, until the burgers reach an internal temperature of 155°F (70°C) and the cheese is melted. Remove them to a platter. Place the rolls cut-side down directly on the cooking grate and toast them for a few seconds, just until they’re golden brown. Remove them to a platter. Top each roll bottom with a leaf of romaine, then add a burger. Top the burger with a slice of tomato and a roll on top. Serve one burger to each person. 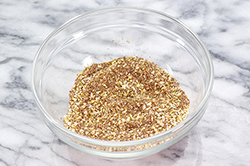 A rub doesn’t have to be complicated or use odd ingredients to be good. The right combination of the usual ingredient suspects might just make you a backyard legend. In a small bowl, combine the salt, granulated garlic, granulated onion, chili powder, raw sugar, pepper, and cayenne (if using). Mix them well until fully blended. Store in an airtight container in a cool dry place for up to 2 months.